Recently I was asked the question, "If you fail to specify a 'pay by' date for a client, at what point, if any, can they legally be considered delinquent for failing to pay?" No more fundamental question on "The Business of Law®" can be imagined. Every engagement to provide professional services should begin with a written agreement on services to be provided in order to be enforceable. And one of the terms of an engagement agreement is fee; another is payment date. No jurisdiction of which I'm aware will enforce an "agreement" that lacks designation of fee. Another element, however, is due date. Some jurisdictions may supply this missing element with "reasonable" since it's not a major omission. But, then, you get into what is reasonable. Under most commercial circumstances, this means 30 days after billing or receipt, whichever is later. Law firms are not the victims of their delinquent clients. 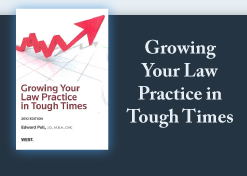 Attorneys and law firms cause their own collection problems by failing to establish collection policies, to explain the policies from the start of an engagement, and to enforce those policies consistently during the engagement. Lack of a firm-wide written collection policy, or a refusal to use outside collection agencies to collect on overdue accounts, can both lead a firm to financial disaster. While the collection policy need not be part of the engagement letter's fee agreement, the engagement letter should clearly state the consequences to the client for failure to honor the agreed-upon payment commitment. Your written policy must detail how to keep track of when clients are behind on their payments and how to contact clients when they are late with payments. Do not be deterred by clients who assert that detailed collection terms somehow imply that they are dishonest or a default risk. The professional service provider must assume that every client will be a collection problem. That way, you will be well-armed with a variety of signed—and initialed—agreements, which will demonstrate the client's advance knowledge and acceptance of the payment terms. Once terms are set, it is vitally important that you move quickly to collect any overdue accounts. One study shows that, a bill that is over 60 days past due can still be collected about 89% of the time. However, that drops to a 67% likelihood of collection after six months, and to a 45% likelihood after one year. It should never reach this point, however. Vendors, including professional providers, will not be in business very long if they fail to follow through with the elements of their engagement agreement: setting a reasonable fee, due date and consequences for failure to pay. Breakfast in Monterey, CA: On Saturday, September 25th, I'd like to get together with clients and colleagues in the Monterey area. Everyone who has read my LawBiz® Tips electronic newsletter, bought one of my books or audio products, or reads my blog—you're invited to join me for breakfast...on me! We can chat about the business of the legal community, learn about some trends that I see coming up, meet with other legal professionals in the area and network to your heart's content. Just send me an email R.S.V.P. at edpoll@lawbiz.com if you're available Saturday, September 25th at 7:30 a.m. I'll send you the location by return email. Hope to see you there!